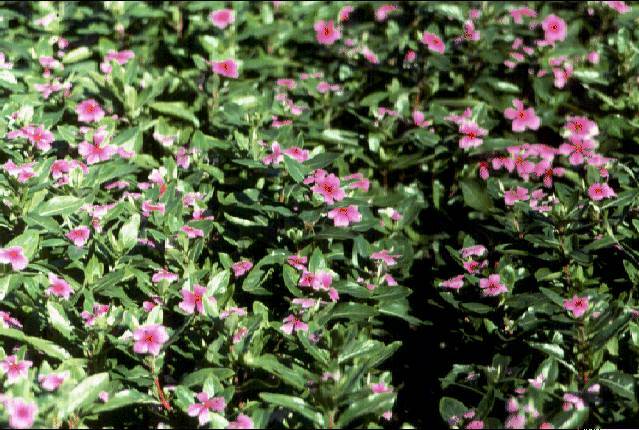 Vinblastine and vincristine are alkaloids found in the Madagascar periwinkle, Catharanthus roseus (formerly known as Vinca rosea). The natives of Madagascar traditionally used the vinca rosea to treat diabetes. In fact it has been used for centuries throughout the world to treat all kinds of ailments from wasp stings, in India, to eye infections in the Caribbean. When researchers began to analyse the plant in the 1950s they discovered it contained over 70 alkaloids. Some were found to lower blood sugar levels and others to act as hemostatics, but the most interesting were vinblastine and vincristine, which were found to lower the number of white cells in blood. A high number of white cells in the blood indicates leukemia. So a new anti-cancer drug had been discovered. They work by preventing mitosis in metaphase. These alkaloids bind to tubulin, thus preventing the cell from making the spindles it needs to be able to divide. This is different from the action of taxol which interferes with cell division by keeping the spindles from being broken down. Vinblastine is mainly useful for treating Hodgkin's disease, advanced testicular cancer and advanced breast cancer. Vincristine is mainly used to treat acute leukemia and other lymphomas.